The pop star was there on behalf of Global Partnership for Education and Global Citizen in her role as Global Ambassador for Education. In September, Rihanna's Clara Lionel Foundation partnered with the Global Partnership for Education and Global Citizen on an initiative designed to promote access to education for children across the globe. This week, the pop star was in Malawi to meet with educators, government officials, and schoolchildren, TMZ reports. 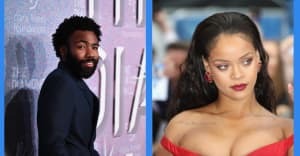 "Working together, I know we can amplify our efforts and ensure that millions of children gain access to education globally," Rihanna said in a statement about the program in September. See pictures of Rihanna with Global Citizen CEO Hugh Evans as well as Julia Gillard, GPE’s board of directors chair during a visit to a school in Malawi above.